Here's where to watch every episode of Homicide: Life on the Street season 7. Mouseover or tap an episode to see where to stream it. Click or tap the play icon to stream it on the best available service. The Twenty Percent Solution Oct 30, 1998 A woman brings to the homicide unit her mystery-writer husband's videotaped declaration that his literary agent is responsible for his murder. Ballard and Gharty catch the case -- only there is no body or crime scene. Meanwhile, Munch and Bayliss investigate the death of an elderly woman that occurred during a break-in -- was it a homicide? Munch would rather leave for his weekend rendezvous with Billie Lou. Ballard and Gharty's investigation becomes a red-ball as they find evidence in the writer's office that a crime was committed. A break leads to the arrest of the literary agent and his accomplice, although Danvers can't guarantee a conviction. Falsone asks Ballard if she would like to go out Saturday night; just then the jury comes back. And a sharp-eyed juror insures that justice is done. Wanted Dead or Alive (2) Nov 20, 1998 Lewis is transported to the hospital, as is the passenger of the car that MGee hit. Gharty is worked up about women and finances, because he and Flora and their lawyers are going to be working out the financial details of their divorce. Gee & MGee are not interested in cooperating with the bounty hunters; however, Knoll is the only one who can get any information on the whereabouts of Errico from Errico's mother. She has promised to page Knoll when her son calls. (Joe Errico has gone south to Miami.) Knoll offers to pay the expenses of having homicide detectives go to Miami and work with him, but Gee declines that generous offer and sends his detectives separately. In Miami, Bayliss and MGee work with Knoll to capture Errico. Knoll offers to split the huge bounty with the homicide detectives, which they of course refuse. MGee decides that the best use for the bounty might be for the man whose wife had died from the injuries she sustained in the car accident. Bones of Contention Jan 15, 1999 A body buried for 6 - 20 years is uncovered at a construction site. Munch and Lewis begin the process of trying to solve this old crime. Falsone and Ballard's relationship has heated up, and that fact becomes apparent to their fellow detectives. Sheppard returns to work, but is discouraged when Gee assigns her to desk duty. Gharty tells Billie Lou that he'll attend her bass-playing concert. Munch & Lewis with help from the ME and MGee, identify the body and then begin to piece together what happened to her. Gee lays down the law to Ballard & Falsone: they have to knock it off if they want to stay working on the same shift; they agree. A Case of Do or Die Feb 12, 1999 Ballard and Bayliss are called to the scene of the mysterious death of a woman, whose body is found at the bottom of a forty-foot cliff. This victim was to be married the following morning. The two detectives work to determine whether the death was accidental or intentional (via murder or suicide). Meanwhile Sheppard and MGee begin investigating the death of a movie patron, whose body was discovered after the show ended and the theater cleared out. MGee mentions to Sheppard that his sister is about to have a baby, which means Gee is about to become a grandfather. Their investigation reveals that the movie patron was regularly loud and obnoxious and thus bad for business. When an overdose of a sedative is found in his bloodstream, the detectives question the theater owner, who was currently in litigation with the victim. Unfortunately for Ballard and Bayliss, their case remains unsolved. Truth Will Out Mar 26, 1999 A woman comes looking for Falsone, knowing that he solved a real old case, wants him to look into a case for her from 1972. Her parents told her that she was responsible for her younger brother's death. Despite being three years old at the time, the woman has doubts about her parents' story. So Falsone and Stivers reopen this case, which was closed by Gee when he was a new detective. The reopening of the case makes Gee think that he may not have been totally focused on the case at the time. Their investigation reveals the woman's mother used her as a scapegoat for the mother's crime. Bayliss and Ballard's case involves a body that was shot, but the victim was already dead from a drug overdose. The male sergeant at the scene piques Bayliss's interest, so they get together for drinks. Their relationship doesn't develop, because word is spreading about Bayliss being the owner of the ""In Plain Site"" web site. Bayliss begins feeling pressure about his being different and considers celibacy. Zen and the Art of Murder Apr 2, 1999 Lewis and Munch begin to investigate the death of a Buddhist monk beaten to death. Lewis isn't interested in working the case with Bayliss, whom he feels, may become too emotionally involved. Ballard and Falsone agree to call their relationship quits. Ballard and Gharty's case involves a man who was shot down in the street; the three witnesses that saw the shooter all have different recollections of his appearance. As a result, their prime suspect cannot be charged. Gee asks for Bayliss's assistance in the Buddhist murder and to Lewis's dismay, Munch abdicates his position in the investigation to Bayliss. Lewis and Bayliss take different approaches to the investigation. Bayliss's approach leads him to the man who committed the crime, but cornering his suspect leads to a showdown with guns and Bayliss fires a fatal shot. Later Bayliss tries to reconcile the shooting with his own feelings about being a Buddhist and being a cop. Lines of Fire May 7, 1999 Emmet Carey is holding his two children hostage in the apartment of his wife's sister. He sees MGee on television and decides that he will talk only to him and occasionally Gharty who is also on the scene. The wife also shows up on the scene and gets past the security. Her screaming sets of Emmet, who fires two shots out that window that strike his wife dead. MGee has to keep the information from him as they continue to negotiate. The crisis ends when Emmet releases his stepdaughter, but makes a deadly choice for himself and his son. 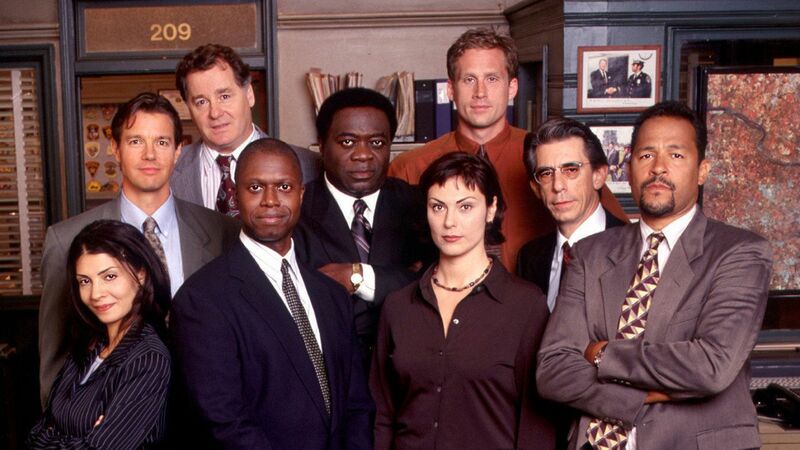 The Why Chromosome May 14, 1999 When the men are nowhere to be found, Sheppard and Ballard team up to investigate the death of young girl, who's a teenage gang member. With the wedding one week away, Billie Lou asks for Munch's help with her neighbor's abusive boyfriend. After Munch approaches him strongly, the boyfriend retaliates by coming to the Waterfront and slamming Billie Lou's head on the bar. Munch claims he came on strong with the guy, because his ""testosterone riddled behavior"" was due to the celibacy Billie Lou imposed on him, to make their wedding night more special. Billie Lou wants to delay the wedding until the welt on her forehead goes away in about 3 weeks. After Sheppard and Ballard solve their case, Sheppard reminds Lewis that his problem with her is not going to keep her from doing her job. Forgive Us Our Trespasses May 21, 1999 Sheppard and Bayliss await the trial of Luke Ryland, the Internet killer. A number of delays keep the hearing from being held; the last time it is because Danvers can't make it due to being held up in another trial. Because of a technicality in the law, Ryland is set free. Bayliss is outraged and winds up pushing Danvers, who later threatens to put Bayliss up on charges. Gee's daughter Teresa arrives, to help with the celebration of her father's promotion. Gee asks Bayliss to apologize to Danvers and Bayliss declines. Lewis and Falsone look into the murder of a drug addict whose husband looks like the most probable suspect. The victim's mother-in-law isn't very cooperative and her sister is a nun who thinks her brother-in-law is an architect. Gee worries about whether or not he will be able to perform in his new role as Captain of the property crimes division, later he turns down the promotion. Bayliss and Lewis have words about the way each other handle their memories of the past.